Why should I use GCW ADS Purple? GCW ADS Purple is a blend 19 powerful antioxidant nutrients. By simply adding one scoop per day to a glass of water, juice or a smoothie, you support your body in attaining optimal health. It's also a convenient way to boost your energy. GCW ADS Purple is comprised on many of the fruits and vegetables you wish you would eat every day, but rarely get the chance to consume. How does GCW ADS Purple taste? It might just be the best tasting nutrition drink mix available. The berry flavor is enhanced with stevia and purple carrots. It's delicious mixed with water or juice and adds nice flavor to a smoothie. If you like the idea of nutrient-rich drink mixes, but don't like the taste, this is the one for you. What's in GCW ADS Purple? Pomegranate Extract has a higher phenolic content than most pomegranate juices without the sugar and calories. Acai is a small dark purple fruit and has one of the highest ORAC values of any edible berry. It has 10 times the antioxidants of grapes and twice the antioxidants of blueberries. Goji berries have a wide range of anti-aging benefits from energy enhancement to cardiovascular protection. Goji is considered one of the most nutritionally dense food. Camu Camu is a small purple fruit that strengthens the immune system especially when the body is stressed. It has more Vitamin C than any other known plant in the world. Mangosteen supports joint, intestinal and immune system health. It helps neutralize cell damage caused by free radicals and supports optimal cell functions. What are the benefits of GCW ADS Purple? 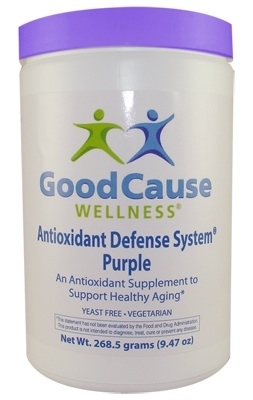 Contains potent antioxidants such as such as phenols, anthocyanins, ellagic acid, proanthocyanidins, bioflavonoids and Vitamin C.
Anti-aging nutrients in GCW ADS Purple include Alpha GPC, L-Carnosine, and Folic Acid to support mental energy, focus and clarity. GCW ADS Purple offers nutrients that support healthy aging, optimal nerve and brain functions, strong cellular health, good circulation, strong immune system functions and smooth, healthy skin. .
As a dietary supplement, mix one level (10.95g) scoop in six to eight oz. of cold water or juice, one time daily. .
Other Ingredients: natural raspberry, strawberry, cherry, vanilla and spearmint flavors, banana powder, cinnamon, citric acid.